Mrs. Yollis' Classroom Blog: Vote For Us ~ Edublog Awards! Vote For Us ~ Edublog Awards! The Edublog Awards are here, and Mrs. Yollis and her students are thrilled to be nominated! There are many great nominations and we encourage everyone to look through all the categories before casting your daily vote. If you'd like to support us, here are the categories! You can cast your votes from a home computer, a work computer, an iPad, or a cell phone! Remember, you can vote daily! Congratulations on all your nominations! I voted this morning and will continue to do so because you rock! Thank you for showing our students an invaluable introduction to blogging. Well I am not surprised that you've received the nominations for yourself and your students - good luck with the voting. Mr Webb, Melville Intermediate School, New Zealand. Well done getting short listed for the Edublog Awards. Congratulations to Miriam and Jaden too. I really wish everyone could win but unfortunately only one with in each of the catergories. Anyway I think you are all winners! I really hope our class blog wins! I told my brother to vote, I told my grandparents to vote, my parents, my aunt and uncle, and my mom and dad told there friends to vote, and seven of my moms friends and five of my dads friends actually did vote! That equals twelve votes! On our laptops Royce and I voted on all of the categories that you recommended. I also did vote for Miriam because in my opinion, she is one of the best kid bloggers I have ever seen! You have had many great achievements so why not get another one. Last year Mrs.Morris's Blog who is from our school was nominated. After I leave this comment I will vote. I am a student at your school. My name is Mark L. I was in Mrs. Wilson's 3rd grade and now Mrs. Kaplan's 4th grade. I love your blog. I'm voting for you daily. My friend Jaden encouraged me to create my own blog, GBM Corner. I had a great time voting in the computer lab. I hope we get first place for best class blog. It would be very exciting. I already told my grandparents, aunt and uncle, cousins, and my parents to vote. I also voted for my sister Miriam's blog because I think she has an excellent blog. Thank you for voting for me. I really appreciate it. I hope you visit my blog and leave me a comment. I also voted for Mrs. Yollis' class blog and hope she wins. I am Ms. Spence. I attend the University of South Alabama where I am enrolled in Dr. Strange's EDM 310 class. I just wanted to congratulate you all on all of your wonderful accomplishments and wish you the best of luck. You deserve each nomination and to win. We can't wait to hear/read the results of the Edublog Awards! How did you and the class do? Congratulations Mrs. Yollis on your three 2011 Edublog Awards! I'm so happy for our class and group blogs. I really enjoy being part of your class and blog. Thank you for making it happen and for teaching all of us in your class. WOW! Our school won a lot. We won "Best Class Blog" with 314 votes, Jaden won "Best Student Blog" with 610 votes, "Best Group Blog" won with 324 votes for "Our World, Our Stories," and you won "Most Influential Post" (I'm not sure how many votes that got). I had a great time voting, did you? Congratulations on all your Eddy wins! Your blogs have been great educational resources for bloggers, as well as inspiring for other teachers and students! Thank you! Wow! Am I the first to congratulate the ever-amazing Mrs. Yollis and her wonderful students?!! So you did it again--congratulations! What an achievement all of you. 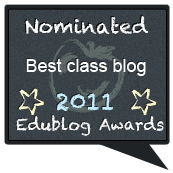 Congratulations on winning best class blog at the Edublog awards :) You should all be really proud of yourselves. Family Blogging Month Winner: Sarah Plays Chopin! Thank You 2KM, 2KJ, and B4! Thank You for the Edublog Awards! Meet Miss W. and Davo!